Connecticut birding has a long history of citizen science, of which the Connecticut Bird Atlas is only the most recent incarnation. Summer Bird Counts (SBCs) – the mid-year equivalent of Christmas Bird Counts – have been run in the state for nearly three decades and aim to count birds within several 15-mile diameter circles scattered across the state to help track population changes. 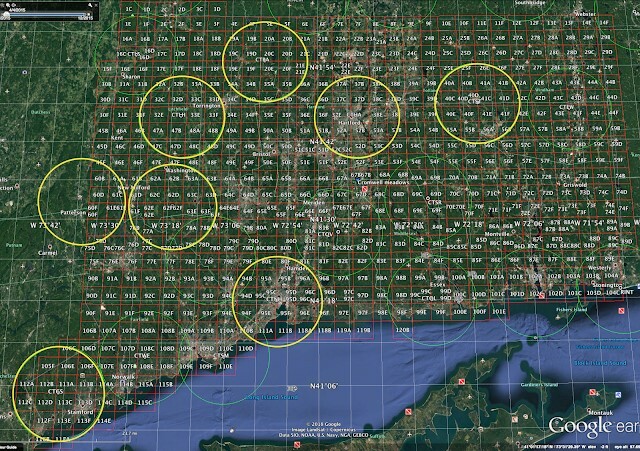 Currently, there are eight SBC circles, each with its own coordinator, and each with a planned survey spread over one of the weekends in June. For more information about the project and how to get involved, go to this web site, created by SBC lead coordinator and COA board member Tom Robben. Although the goals of the SBCs are different from the atlas, the two projects are complementary, and birders participating in one can double the value of their data by contributing to both. If you are planning to do an SBC, then consider also submitting your observations to the atlas project. And of course, if you are out atlasing in one of the SBC circles, look up the local coordinator at the link above and find out how you can help their efforts. Contributing SBC data to the atlas will require a little extra bookkeeping, but not too much. First, it is important to know that each SBC circle encompasses parts of multiple atlas blocks. Consequently, we will need you to track which observations are made in which blocks. Ideally, this would require keeping a separate checklist for each site you visit or, at least, one checklist for each block you spend time in. You can keep these checklists in eBird or on the atlas project’s paper form, which can be downloaded here. To find out which block you are in at a given time, you can refer to the SBC website, where Tom Robben has helpfully posted maps showing which atlas blocks fall within each SBC circle. If you’re a smart phone user, an alternative is to use Google Earth. From the atlas website, you can download a data file that shows where the atlas block boundaries lie, which you can cross-reference to your position in the field by using the “My Location” function in Google Earth (the file is here and instructions on how to load it into Google Earth are here). Yellow circles show the eight Summer Bird Count circles, superimposed over the atlas blocks (red squares). The fainter, green circles are the Christmas Bird Counts that do not (yet!) also have associated SBCs. Second, we need you to report any evidence of breeding that you see. The simplest form of breeding evidence is simply a species’ presence in suitable nesting habitat. By June, this will apply to most species found, meaning that you can use breeding code H (or code S if the bird is singing). Other behaviours provide stronger evidence and should be used whenever appropriate. Information on breeding codes, and how to report them, can be found here. Not everyone wants to have their birding complicated by lots of data collection. If keeping multiple checklists and logging every observations seems like it will detract from your birding, you can still help the atlas project by reporting just the most important observations. These include evidence that confirms breeding (e.g., finding a nest, or observing a bird carrying nest material or feeding young) or the discovery of species that are hard to find (e.g., rails, bitterns, owls) and might otherwise be missed in an atlas block. These observations can be submitted as “incidental” atlas records, using one of the options described here. Hopefully, for seasoned SBC participants and people who are already collecting atlas data, linking these two efforts and contributing to both will be relatively straightforward. Even if you are new to these projects, however, know that it is much easier than it might seem to integrate important scientific data collection into your everyday birding. Participating in an SBC – perhaps by teaming up with more experienced birders (local SBC coordinators might be able to help make connections) – could be a good way to get started. Next PostNext Drumming, cowbirds, eggshells: what breeding code should you use?